This is one of my favorite casseroles especially now that the weather is cooling down. I have so many ideas on different variations of this recipe so please keep an eye out for those…. Preheat oven to 400°F. Coat an 11×7 baking dish with nonstick cooking spray. In a large skillet over medium high heat, brown onions and meat for 4 to 5 minutes, or until cooked through, stirring occasionally. Discard any excess fat if needed. Season with salt and pepper if desired. (the soups contain sodium so use the salt sparingly). Allow meat mixture to cool for about 5 minutes then pour into a large bowl and combine with both soups. Spoon mixture into backing dish. Sprinkle half of the fried onions over mixture then arrange tater tots on top in a single layer. Top with the remaining fried onions. Bake uncovered for about 45 minutes, or until tater tots are golden brown and meat mixture is bubbly. Written by: Drea0208 on 2010/10/03. This entry was posted by Drea0208 on 2010/10/03 at 9:33 PM, and is filed under Recipes. Follow any responses to this post through RSS 2.0. You can leave a response or trackback from your own site. Looks good! 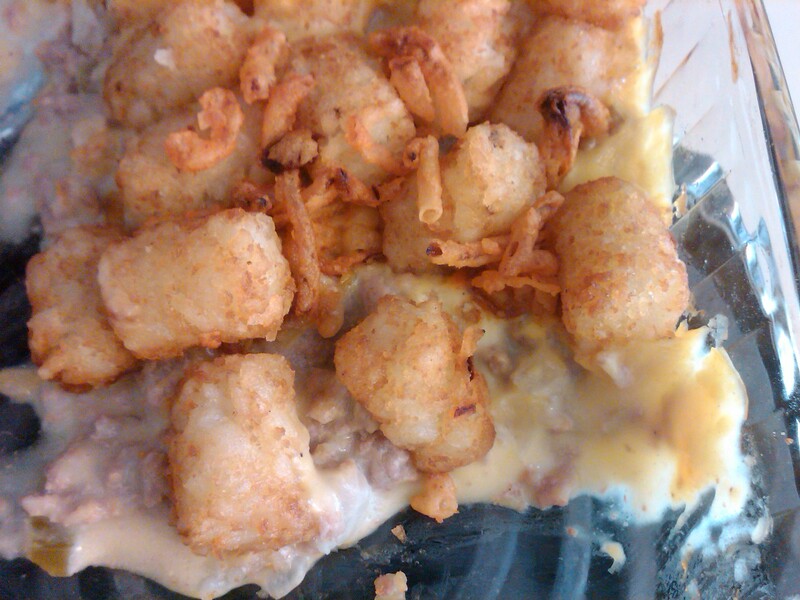 I have a recipe cllaed tater tot casserole that is really good and similar to this, minus the Mexican influence! But I can’t have it anymore. I can no longer eat wheat and it calls for cream of mushroom soup (which has wheat in it). This can still get me my tater tot fix! Thanks!